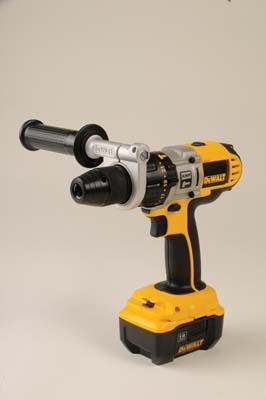 Not having tested DeWalt gear for a while it is interesting to see a consistency in design that persists, both in colour and the rugged industrial styling. The DCD925 is heavy but comfortable to hold and use, and the casing is tough and partly covered in rubberised grip areas. The Rohm keyless chuck is unusual because the jaws slide up between an outer split collar â€“ this means the jaws are narrow and project inwards away from the collar. It is tightened by hand. Unusually it has a three stage gearbox giving maximum no-load speeds of 500, 1,250, and 2,000rpm with commensurate torque settings. A special grip collar allows selection of hammer, drill and screwdriving settings - the latter engages the twenty-two stage clutch collar for soft screw setting-in. The XRP Series batteries are claimed to give 40% more run-time than conventional, i.e. NiCd types. In common with other Li-ion batteries, it has to be latched properly into the rather compact charger which lacks the customary traffic light display typical of most intelligent chargers. Stand this drill down and switch on and it rocks under the force of immediate motor startup, indicating a hefty torque'd motor. 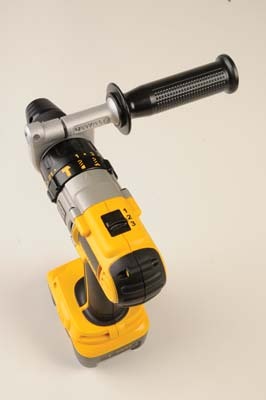 The swivelling pistol grip is essential for personal safety as this drill generates a lot of force. Using the biggest holesaw I had, I tried drilling through a 45mm thick piece of softwood in second gear and it just kept going. 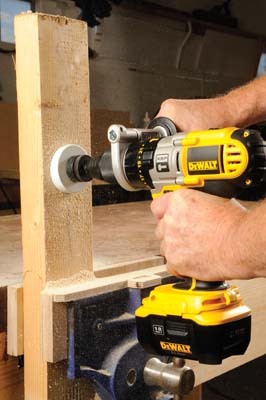 I would happily recommend this drill for just about any task. It is well-built and very capable.